Generally speaking, at On-One towers we've two types of bike riders, skinny tyred whippets who are happy to ride up and down anything nature puts in front of them and well, those riders who prefer a bit of gravity assist (and an uplift wherever possible). Fortunately, the eggheads at On-One have been slaving away these past few months making top notch bike helmets to suit both groups. 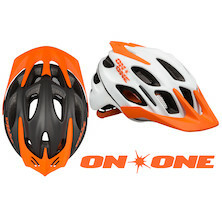 Our new On-One XC helmet is built to offer outstanding protection in a lightweight package. It's superbly ventilated, cut low around the back and features our 3-way adjustable occipital cradle. With a fixed peak, In-mould anchored fixtures and fittings and a stylish outline what more could you want for a day at the races? 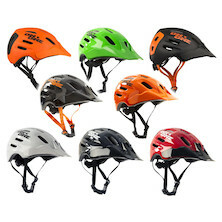 The On-One Enduro helmet has been built to protect your noggin if you prefer to be charging downhill at breakneck speed rather than crawling up the climbs. With a more robust shell, lower cut back and a slightly thicker shell the Enduro helmet is certainly tough enough to help keep your noggin in one piece. Fitted with our 3-way adjustable occipital cradle, comfort fit anti-bacterial pads and an essential fly-screen to keep the winged beasts out the Enduro helmet has already proved itself to be sup[remely capable on the trails. Choose your poison to suit your riding style and stay safe. We'll see you on the trails.